When your employee's arrive at work and check in for their shift, the clock in and out times will be recorded on the Timesheet. The Timesheet will pull the clock in data immediately so you will be able to see if an employee is present at work by opening the Timesheet for that week. The employee's initial scheduled time will appear at the top and below is the actual time the employee clocked in on their App. If an employee is missing or late the Timesheet will flag this. If an employee checked in incorrectly or forgot to check in you can edit this here. 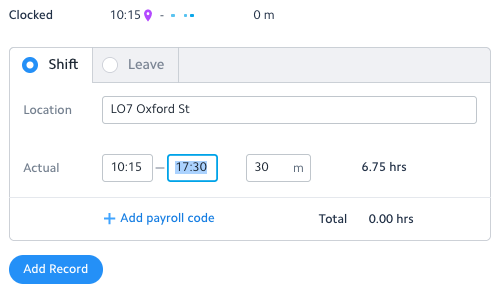 If you click on the relevant shift entry and open the right hand window you will see the 'Actual' time's underneath the location this shift took place at, here you enter the actual time the employee arrived and left work and hit either 'Save' or 'Approve' - so long as all the information for this shift is correct. The Timesheet will also display the location of the employee when they checked in/out on the map at the bottom of the window. If you do not use Geo-Fencing within your company this is very helpful to see if an employee actually checked in at work or not. For Time and Attendance, you can set rules to how the clock in times round up. For example; if an employee is scheduled to start at 9:00am but they check in at 8:52am the system will round this clock in up to the scheduled time of 9:00am and let you know the employee was on time. If the employee clocked in at 9:12am you can either leave the clock in data as it is and they will be flagged at 12 minutes late or you can set this to round to the nearest 5, 10, 15 or 30 minutes. You can also specify the number of minutes in the window around the scheduled time. For example; if you chose to set this as 5 minutes and the employee clocked in at 9:04am then they would still be marked as on time.